Combined Golf Cart Rake & Ball Retriever | retractable to 34 inches | 7 ft length | heavy duty. The prefect golf cart accessory - a portable rake and golf ball retriever all in one! This combination golf rake and golf ball retriever is all in one. Just in case you go in the water, use the rake to bring the golf ball closer and the retriever to pick up the ball. --Portable, durable, and light weight. --The rake comes in 7 ft. length. --When the rake is in the retracted position, it is approximately 34". --Rake is made of ABS glass filled nylon, and the tines are extremely sturdy. --Rake is strong enough to rake wet sand. 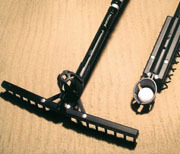 --Retractable rake and golf ball retriever. Customers who bought the rake and ball retriever were also interested in the club and ball washer, and garage floor mats. Let our friendly customer service staff answer your questions about our golf cart combination ball retriever and rake. Retrieve your golf ball either in the sand or water. Please click on any of the golf cart accessories to the left to get full technical descriptions, prices, and ordering information. Make your golf cart look the best in town with golf cart accessories from Frugal Dougal’s Golf Cart Accessories!